Incidentally, given how closely this study hits home, I would expect it to be attacked–just as Naomi Oreskes’ famous paper “The Scientific Consensus on Climate Change” was. PNAS reviewers and author Bill Anderegg apparently knows next to nothing about Google Scholar since searching for just the word “climate” with an author’s name will bring results from non-peer-reviewed sources such as books, magazines, newspapers, patents, papers simply in PDF format but were never published, duplicate listings, citations and all sorts of other erroneous results. There is no “peer-reviewed journal only” search option in Google Scholar. Not to mention using those search techniques will get results from authors with the same name but who are completely different people. For instance even when using the author’s name in quotes, Google Scholar still will show results from authors with only the same last name. Thus authors with common names will get inflated results. Take for instance using author “Phil Jones” with the search word “climate”, you get almost 5000 results! The study is worthless. Poptech – any dictionary has lots of words in it and you don’t necessarily get overwhelmed (maybe you do…) starting your search for word meaning in the dictionary. The paper convincingly describes how the team used Google search. They did not just write a Perl script to collect all the author and title verbage – they went the next step and carefully reviewed each. You can tell that this is what happened if you follow how they followed citations of popular articles. It seems like climate deniers have stages they go through before having to face up to the facts. First they deny something they are doing is having an adverse effect on the environment. Next, they deny there is a growing consensus that conflicts with their denial. Next, they deny a finding about the consensus that confirms their skepticism is misguided. Maybe when climate deniers start suffering and seeing others suffer because of their misdeeds they might just have to fact up to the facts. The IPCC says that “more GHGs results in more warming” (AR4, WG1, Ch1, p116) and yet when the GHG water vapor triples to 100% when it rains, the temperature does not go up, the greenhouse effect temperature does not triple. The IPCC science logic is false. When the sun rises in the morning and the number of photons required for the Greenhouse effect increases, then the GHE temperature increases as more of the excess CO2 and water vapor GHGs are used, in spite of the IPCC insisting that you need more man generated GHGs and CO2 to get more warming. It is the number of nature made photons, not the number of man made GHGs that dictates how much greenhouse warming we get. The IPCC and computer models are incorrect. They took the ambiguities of Google Scholar into account, so they are aware of its limitations. They also provide a link to their source documents, so if you want to double check their numbers to prove them wrong, knock yourself out. Wow Poptech, it must be easy to remain skeptical when you don’t bother to even so much as read the methods of an article before throwing out criticism. Just like with creationists, when your only tactic to support your position is to LIE about the methods of the contrary position you lack any credibility whatsoever. Incidentally, speaking of misrepresenting – in your list of 750 supporting skepticism its awesome that you include corrections and replies to articles, artificially inflating the number. Regardless, 750 is still a minute number relative to the peer reviewed articles supporting ACC – and how many of those skeptical articles have anyone bothering to cite them. You also don’t define your criteria for peer review – blog comments don’t count by the way. In short, your methodology is significantly more suspect than the methodology in the paper you (incorrectly) criticize. Kirk, no they did not, they only did that for the top 4 papers used in the citation analysis. Robert E, “Overall number of publications” excluding the word “climate”. They did multiple analysis, one was total number of “climate” publications. It should be noted that many of the “skeptical papers” listed in PopTech’s “750 Peer-Reviewed Papers Supporting Skepticism of ‘Man-Made’ Global Warming Alarm” aren’t skeptical of man-made global warming at all. He cleverly uses a page title that doesn’t reflect the actual contents of the list and then describes the list differently in the page text. But he only ever provides the page title, knowing the 99% of readers will never look at the page text. Pielke Jr: 21 papers by me and/or my father are in this guy’s list of “skeptical papers”, but he should recheck it, since we are not AGW skeptics. PopTech (“Andrew”): Yes you are. Pielke Jr: No we’re not. Now, our friend here has at some point retitled the page ever so slightly, adding the word “Alarm,” which wasn’t originally there. No matter. Anyone reading the title is still going to think that it lists 750 papers skeptical of man-made global warming. It does not. PopTech says, “The study is worthless.” There is indeed something worthless here, but it’s not the Stanford study. It’s PopTech’s little homemade list. Josh, so sad to see you use the tired creationist argument (you need new propaganda), I support evolution theory BTW. ChrisD, since you lied about what I actually said on Dr. Pielke’s blog, I will summarize. All his papers support skepticism of alarmist claims. Such as increased hurricanes or floods from AGW which is explicitly defined in the title and first sentence thus match the criteria for inclusion on the list. There are also many papers directly skeptical of AGW. Poptech – you realize the abstract is fairly useless other than to let you know whether the paper is of interest to you, right? Its the sales pitch to get you to buy access to the rest of the paper. The reason you would want access to the rest of the paper is that the methodology section that matters most (followed by the results – but how a person got results matters more than the results they got. the results are worthless if gotten in a poor manner). Incidentally, if you are tired of being compared to a creationist, quit using their bogus tactics. The fact that you apparently don’t read passed the abstract is probably why you are so willing to add anything to your list of denier papers. Ignoring all evidence and stubbornly sticking to a conclusion you like rather than the one supportinged is an identical feature of the climate deniers and the creationists. Also, what’s up with the firefox myths? You really come across as a guy who picks something he doesn’t like and then goes to all lengths to misreperent it. In doing so you actually negate the legitimacy of any real flaws that are present. ChrisD, just to point out your dishonesty, here is my actual post on his blog (there was another Andrew replying, which was not me). Roger, the papers included were any that would support a skeptical position of either AGW is not real or AGW is real but skeptical of certain alarmist conclusions, either environmental or economical. “Pielke Jr: 21 papers by me and/or my father are in this guy’s list of “skeptical papers”, but he should recheck it, since we are not AGW skeptics. PopTech (”Andrew”): Yes you are. Clearly a lie and you linked directly to the truth. everyone is going too cool it now. thanks. arg, cut and paste fail in my post – sorry for the weird disjoin between the last two sentences of the first paragraph, and then the second paragraph. Tangentially, John, you don’t have the basic understranding of photons and heat. A photon needs a molecule to absorb it and convert the energy to molecular motion to generate heat. Photons alone do not create heat, but are just one part of an equation. CO2, incidentally, nicely provides the other part. Welcome to basic chemistry, circa 1896. You all might be interested in having a look at the discussion some of the critics of the paper (such as Judith Curry, Roger Pielke Jr. and Jonathan Gilligan) are having with one of the study’s authors. PopTech, anyone can read that blog post and see that Pielke said that his papers didn’t belong in your list, and you said they did. It’s really that simple. PopTech has been shown numerous times how his ridiculous list is nothing but hogwash. Yet he continues to peddle it. He is either spectacularly ignorant or an unashamed shill. Here may be the definitive rebunking of ‘PopTech’s’ “list”. FYI I still have multiple comments here in moderation. I think that Keith Kloor’s link above provides some links to some intriguing references that have the potential to make this into a much more worthwhile discussion. Such as this one: http://news.sciencemag.org/scienceinsider/2010/06/scientists-convinced-of-climate.html#more. Humans have a tendency to want to deal with absolutes. It is easier to recognize this flaw in others, rather than in ourselves. In battling deniers it is important for us not to get locked into a yes/no absolutist mode. Rather than drawing our own arbitrary lines, we ought to be emphasizing the broad spectrum of evidence that supports conclusions based on science. Global Climate change is one of many scientifically oriented issues for which an ability to deal in nuance and uncertainty are vitally important. I give the paper an A for Google Scholar Illiteracy. No. The final stage of denialism is to proclaim, “Oh well, it’s too late to do anything now”. There is never a stage where they have to face up to the facts. @Jinchi, I’m not sure that all those labeled as climate change deniers are all necessarily unaware of the facts. I do believe that in many cases we are actually dealing with large economic entities that realize that their short term economic self interest lies with thwarting environmental regulation. As was true of the tobacco industry in its regulation battle, the hierarchy of those firms may be well aware of the actual science and make other decisions accordingly. Our opposition may ultimately be active purveyors of disinformation. I would like to emphasize that skeptics, who question certain aspects of the scientific evidence or its interpretation, are in a different category altogether. Whether ultimately right or wrong, legitimately raising questions should not be dealt with pejoratively. However, maybe some who comment here need to realize that they have been co-opted by powerful and disingenuous forces. Ignore the fact that the predicted warming has not occured, In fact we have been cooling for 10 years. When are we to throw out the bad theory? Sunspot activity seems to corrolate very nicely with climate change. This is like the “Mother Church” & Galileo -don’t watch the sky, read the Bible! Who needs data when we have the myth of Global Manmade Warming? This is one of the reasons I intend not to renew my subscription to Discover. If you dare, check out how the surface stations in the US have been compromised. Climategate reveals how those who have the right outlook, get grants & control who is published. If the results go the other way, it’s ok to “Hide the decline” or “adjust” the algorythms etc. Here is another take on this “study”. If you dare. The guys that did this study, are they science historians? sociologists? statisticians? anthropologists? WARMISTS? Oh. They’re warmists you say? Hmm. I wonder if they’re bias going in had anything to do with the methodology they used. I wonder how sensitive their results are to their particular choice of numbers: 20 papers, etc. So say Chris, you’re a scientific fellow, how about it? Instead of gushing all over this paper, could you consider being a scientific fellow journalist and discussing it? Oh. Okay. Carry on then. In fact we have been cooling for 10 years. Ten years is too short a period to establish a meaningful trend–but Earth hasn’t been cooling in the last ten years anyway. When Stephen McIntyre produced his paper showing that the Hockey Stick calculation was false, something which is now accepted as correct, Nature repeatedly refused to publish it while publishing numerous ad hominum attacks on McIntyre, to which, obviously, no other reply was allowed. That published papers still show an overwhelming publishing bias towards alarmists is hardly surprising & nerely shows hiow corrupted the system is. Far more important is the fact that, with 31,000 scientista having signed the Oregon Petition saying that far from being catastrophic, carbon rise is likely to be beneficial, not a single al;armist out of 10s of thousands around the world asked has been able to name to scientists who support catastrophism & aren’t paid by the state. ” were able to anme one such scientist; both named the same man; since climategate he has changed his mind. Perhaps equally important is that though several newspapers have reported this “study” only 1, worldwide, has chosen to report this astonioshing evidence that no independent scientists support warming alarmism & that it is entirely state supported. An example of “The whole aim of practical politics is to keep the populace alarmed (and hence clamorous to be led to safety) by menacing it with an endless series of hobgoblins, all of them imaginary.”Henry Louis Mencken. The petition is a PR stunt, nothing more. Anyone can fill in a card and mail it in, saying whatever he wants; the signatures and claims aren’t verified. Virtually any degree in virtually any field qualifies one as “a scientist in a relevant field”; one of the “scientists” I checked turned out to be a veterinary surgeon specializing in large equines. (By their criteria, I’m qualified to sign, and, trust me, I ain’t no scientist.) The original petition was a mailing that was printed to look as if it came from the National Academy of Sciences, complete with a bogus paper in NAS format that even showed fake volume and page numbers. Those who ask for the removal of their names from the list of signers are ignored. The petition is a sham that has been debunked over and over and over for more than a decade, and anyone who cites it instantly lose any credibility he might have had insofar as commenting on climate science is concerned. Kindly document these ad hominem attacks from Nature. States also support research into astronomy, medicine, biology, physics, chemistry, and pretty much any other science you can think of. Your implication that state-supported research is of no value is meaningful only if you can demonstrate that the states are requiring scientists to come back with a predetermined result, which you can’t. You are right, the earth hasn’t been cooling for the last ten years, it has been flat or slightly cooling for the past 12 years. Your defective link, I believe, refers to Hansen’s gistemp dataset which is totally corrupt and should be dismissed as such. If you were to do your homework and plot the Giss data you would find that Hansen applies what he calls a “homogeneity adjustment” monthly. He changes his data set temperature anomalies prior to 1998 to reflect cooling and post 1998 temperatures to reflect warming. These monthly “adjustments” include as many as 6 or 7 months out of each reported year. I’ve been entering his data for over a year now and have watched the divergence from satellite data sets gradually grow to what is now nearly a 250% difference from both satellite data sets. You don’t have to believe me, check for yourself. Enter the data today, and then compare it to the data Hansen releases next month and you will see what I mean. If the consensus is so sound, why Hansen’s need to bias the monthly data reported? Unfortunately, this ongoing manipulation has poisoned the integrity of well meaning climate researchers. Sorry, but until Hansen stops doing this, I will refuse to believe anything the Pro AGW crowd spews. I see, yes, 12 years is so much better. It produces the result you want. But, hey, that just happens to set the start date to 1998, the superheated mega-El Nino year. What a coincidence! There’s a term for this. I’ll bet you know what it is. And you don’t like GISTEMP. Fine, use UAH instead. That’s run by Spencer & Christy, not exactly AGW fanatics. But let’s use a timespan that’s long enough to show a meaningful climate trend, like this one. While you’re doing that, look at the spot on the graph that you randomly picked for your start date. Anything jump out at you? BTW, my link wasn’t “defective.” It works just fine. ChrisD the petition is completely legitimate and everything you stated about it is false. It is not any degree but a minimum of a degree in science. There are 9,029 with PhDs and 7,157 with M.S. degrees. Yes there are signers with medical science degrees and they are separated in that category. “The review article sent with the petition could not possibly have been mistaken for a PNAS reprint. I have published many research papers in PNAS. I am very familiar with reprint formats. “Since the initial 17,000 signatories … while about 25 have asked to have their signatures removed. The petition has never been debunked and every single thing you said about it is not true. – removal of all papers over 20 years old. The list is confused, repetitive, full of duplicates and difficult to quantify. It certainly has no data management techniques applied to it. The rump of the list is still interesting reading, mainly of peripheral papers that have little direct reference to the real issue of AGW. A thorough reading is required but I estimate another 30% of papers can easily be dismissed as based on local or short term trends and thus of no interest to climate change science. If anyone can provide web space I can upload further analysis in MS Word form. Otherwise, I will post this data later this month once organised myself. A B.S. or equivalent or higher. Like I said, virtuually any degree. 9,029 with PhDs and 7,157 with M.S. degrees. They say. But anyone can say anything he wants on the petition card, no verification is performed, and the list is published with insufficient information to conclusively identify the large majority of the signers. And I guess you think that a guy with, say, an M.S. in veterinary medicine is qualified to give an opinion on climate that I should care about? I sure don’t. Be he’s qualified to sign this thing. It is not true that the original version of the petition’s included scientific paper … was intended to look like it was from the NAS. Uh-huh. Also, I’m having trouble with unicorns in my vegetable garden this summer. They’re eating all the rutabagas. Perhaps you can show me where he says that they actually were removed, because he doesn’t say so here, does he? Hmm,, struck a nerve? This has nothing to do with dates, but all to do with divergence. There are two independently operated satellite data sets.. UAH and RSS. Both are in direct conflict with the GISS data set, prior and post 1998. The GISS ground based instruments are bordering on run away warming since 1998 while the two independent satellite records tell a completely different story. Hansen is the one who has decided to cherry pick pre-1998 anomalies cooler and post-1998 warmer to change.. err… “adjust”, not me. It isn’t a matter of a specific year or even temperature, but, rather a matter of DIVERGENCE that continues to balloon. If he were changing anomalies from pre-1990 and post 1990 in the same manor, then I would have used that year. I just plotted the slope for you to see how many are being deceived. Do you have a plausible answer as to why he continues to do this? And yes, I do trust Christy, Spencer and RSS more than Hansen who has a bad track record for outlandish alarmist statements which have been proven wrong through empirical evidence. It’s amazing to me that many either don’t remember, don’t notice, don’t care, or subconsciously block from memory these statements in their drone like zeal to be a “believer”. Hansen has proven to me that, at minimum, he has lost objectivity. For what reason is subject to speculation. I’ll leave that up to you. In the mean time, my friend, I will continue to document this ongoing manipulation and stand by my statement that I will not believe any pro AGW research until Hansen’s actions are exposed. I suggest you do the same. Only then can any legitimate climate research resume. BTW, I have tried other posters URL’s and they work just fine. Maybe it’s something fishy with my connection but all of your links still give me the error: “Not Found The requested URL /plot/uah/from:1990/to:2010/plot/uah/from:1990/to:2010/trend was not found on this server. The King In Yellow is stating flat out misinformation. You are pulling that nonsense off of greenfyre’s debunked nonsense. All of your nonsense has been explained to you on the Guardian blog, yet you just repeat it, amazing. 1. There are no duplicate entries. Please list all duplicate entries and try counting the list (the paper count is actually at 775 now). 2. Pielke has never suggested anything be removed and has never sent me an email asking for anything to be removed. He was pointing out that his papers do not reject AGW, which I was well aware and explained they support skepticism of the environmental or economic effects of AGW, which he suggested. 3. E&E is a fully peer-reviewed academic journal as noted at the bottom of the page using sources from EBSCO and Scopus. Thus there is no need to remove them. 4. All the papers are peer-reviewed, some as in the socio-economic section are social science papers but there is no reason to remove them as the list makes absolutely no claim to include only natural science papers. 5. As explicitly stated on the page: “Addendums, comments, corrections, erratum, replies, responses and submitted papers are not included in the peer-reviewed paper count. These are included as references in defense of various papers. There are many more listings than just the 750 papers.” So they will not be removed as they are not counted towards the 750 peer-reviewed papers. 6. The age of any scientific paper is irrelevant. Using this logic all of science would become irrelevant after a certain amount of time, which is obviously ridiculous. This would mean dismissing Svante Arrhenius’s 1886 paper “On the influence of carbonic acid in the air upon the temperature of the ground”. There are over 200 papers published since 2007 on the list. Older papers will not be removed. You keep stating the list is full of duplicates, name one! The only thing dismissed is your misinformation. I would appreciate it if you did not spread misinformation about the list that has already been explained to you. I believe a guy with an M.S. in veterinary medicine is competent to review the material concerning AGW and give a scientific opinion on it, yes I do. Why would a paper that was supposed to look like a NAS paper explicitly say “Oregon Institute of Science and Medicine” and “The Marshall Institute” on it? What NAS journal is either of those references? Only someone absolutely incompetent to be a scientist or who has never read a published paper in their life would think either the “Oregon Institute of Science and Medicine” or “The Marshall Institute” are related to the NAS. As stated these results were later confirmed in a reappraisal. All those who asked to be removed have. Otherwise you would hear about it. If you still believe there are names on the petition that have been asked to be removed, provide one. I spent some time going through it myself, yesterday. So for instance I was very interested to see the publications you include from the Cato institute’s publications. A true bastion of impartial research*. I’ll be continuing to winnow the list once I have time this w/e to read the papers that remain on the downsized list. * Best to be read with a pinch of salt. If the there were a scientific consensus that jumping off a cliff was a good idea, would you do it? No not virtually any degree but rather a degree in SCIENCE. Degrees in SCIENCE include philosophy, mechanical engineering, nursing, anesthesiology, and a ton of other fields that require a B.S. “or equivalent” and have absolutely nothing to do with climate. There is no reason why I should value the opinions on climate of such individuals over my own, and it is ludicrous to refer to these people, as smart and qualified as they may be in their own fields, as “scientists.” I repeat that I am qualified by the Project’s standards to sign, and I ain’t no scientist. This is not just an appeal to authority, it’s an appeal to false authority. Actually the names are verified. Even Robinson admits that they can’t eliminate all fakes. Nor do they ever describe how verification is performed. We are left to take their word for this. No thanks. Sure, we can quickly verify the credentials of Chris Adam, Rick Smith, Donald Avery, L.R. Johnson, and Josh Shultz without access to any other information about them. A list of 32,000 names without without further means of identification is worse than useless. It means that we have only OISM’s word of honor for this. No thanks. Again. All those who asked to be removed have. You know this how? Robinson didn’t say so in the quote you provided. If you still believe there are names on the petition that have been asked to be removed, provide one. Perry Rahn, PhD. He asked that his name be removed in February. It is still there. Only someone absolutely incompetent to be a scientist or who has never read a published paper in their life would think either the “Oregon Institute of Science and Medicine” or “The Marshall Institute” are related to the NAS. Wow, you’re actually right about something. My mistake. I thought it was the same paper, but it was a different bogus review of the literature by the same authors that led directly to the resignation of half of Climate Research‘s editorial staff. Yes, by Energy and Environment, the energy industry’s house organ. Not impressed. I’d also be interested to hear how you know that it was peer-reviewed. A good deal of E&E content is not. Apparently the armed forces of the world’s leading global powers have been taking ample note of anthropogenic global warming and have considered it in their long-range planning of missions for years now, judging from comments I heard Tuesday night at a free public session held at the American Museum of Natural History, “Climate Change: The Threat and Opportunity for Global Security”. Among the speakers were Royal Navy Rear Admiral Neil Morisetti, Climate and Energy Security Envoy of the UK Ministry of Defense and Foreign Commonwealth Office, and retired United States Navy Vice Admiral Dennis V. McGinn, a director on the board of the National Conference on Citizenship, a senior policy advisor to the American Council on Renewable Energy and an international security senior fellow at the Rocky Mountain Institute (RMI). Both stressed the need of steering away from hydrocarbon-based fuels and reducing overall carbon expenditures, and for dealing effectively with the ongoing effects of anthropogenic global warming on issues ranging from successful search and rescue missions of cruise ships in distress in Antarctic waters to organizing emergency relief missions to countries stricken by some unforseen natural disaster. Second, by your logic, we can never take any science-related action. We can’t act on something about which there is consensus because it might be wrong. We can’t act on something about which there is no consensus because, well, there is no consensus. Consensus doesn’t guarantee correctnes, but it does represent the best information we have to work with at the time. Third, some of your examples are just wrong. Flat earth, for example: Scientists (or, more accurately, proto-scientists) knew the earth was round as far back as ancient Greece. They just had trouble convincing the populace and the political structure. I don’t know if that sounds at all familiar to you, but it sure does to me. Global cooling is another one. Not only was there no consensus on that, prevailing scientific opinion was that the earth was going to get warmer, not cooler. So far your “criticisms” have all been completely invalid. When are you going to actually state something truthful? I am still waiting for a single duplicate paper as you incorrectly stated. Both Regulation and the Cato Journal are peer-reviewed as explicitly documented in the notes at the bottom of the page, thus all either Cato publications have been peer-reviewed. Your score so far = ZERO. UAH data begin in 1978. You can plot and trend the UAH data through 2010 for any start year from 1978 through 2000. That is a total of 23 trend lines. Of those 23 trends, 22 will be positive. One will be negative. That’s the one you picked. Why not use start dates after 2000? Because that is just too short to be meaningful, whether it’s up or down. So, really, is anything much after 1990 or so. But the point remains: Not only did you use a too-short span, you also picked the one and only start date that yields a negative trend with the UAH data. My comments keep getting held up for moderation as multiple ones have not appeared here. If you look under the qualifications of signers you can clearly see that no one has a degree in Philosophy, nursing or anesthesiology. There are 9,833 scientists with engineering degrees who signed, which is perfectly valid such as Environmental Engineering and other related engineers. There is nothing ludicrous about a petition of scientists against alarmist claims. The petition has been up for years and the best environmentalists could do was get one fake name on the list (later removed). Re Dr. Rahn, all I could find was a link to a blog post and letter to the editor of a newspaper. If Dr. Rahn wishes to be removed he merely has to mail them a letter requesting it with his signature so they can verify it and it will be removed. The fact that his name is still on the list means he has not done this. The amateurish PR staff at the NAS is not my concern. What sort of amateur “scientist” believes a paper is from the NAS that does not say it is from the NAS? The scientists complaining about it and the PR staff at the NAS who released that statement just verified that they are amateurs who do not know that a paper from the NAS actually says so on the top and not “Oregon Institute of Science and Medicine” and “The Marshall Institute”. Actually one editor got all in a huff – von Storch and when he didn’t get his way (even after being made chief editor) he convinced his friends on the board to go with him. Energy & Environment is not affiliated with any part of the energy industry and both editors are from Universities. You are correct that certain things in E&E are not peer-reviewed such as the editors note, fuel for thought and book reviews. The articles however are. OMG the only way I could post my reply was to do it like that, since I had no idea why it was being rejected. It turned out that the word “as*ociated” with two ss’s apparently gets blocked since the absurd filter thinks any word that begins with as* is profane. LMAO, stupi* (*=d) is also blocked! Rahn said recently that he had sent a letter to the project, but hadn’t heard back. He has since sent another letter, requesting that his name be removed from the list of more than 31,000 scientists. He also wanted a copy of his signature. This was dated last February. It is now June and the signature remains. Frankly, I wouldn’t trust Robinson any further than I could throw him. I have emailed the real Dr. Rahn and am waiting for a reply until then I do not believe it. Again, you miss my point. I am not saying that the earth is not warming. IT IS and has been since the end of the Little Ice Age. What I am trying to point out to you is that the rate of warming since 1998 has been, and continues to be, miss represented by the GISS dataset. The point that I am making is that most GISS monthly anomalies prior to January 1998 are adjusted down, (cooler), while most monthly anomalies after January 1998 are adjusted up, (warmer) by Hansen. These adjustments, usually under .05C+/- may not seem like a lot, but over the course of decades, (12 different data sets per year times 31+ years), they have produced glaring divergence trends from Pre-1998 and Post-1998 when compared with satellite dataset trends. The divergence trend from December 1978 to December 1997 continues to shrink to the point where it now stands at just 0.05C per decade. The divergence trend after January 1998 continues to expand and is now up to 0.12C per decade. Because of Hansen’s monthly manipulation of the prior and after 1998 monthly anomalies, this spread has continuously grown to nearly 2 and one half times, or 250% the rate of the satellite trend. What part of this don’t you understand? You seem to be an intelligent person, but, I don’t know how to explain it any clearer. You accuse me of Cherry Picking 1998, but it is Hansen, not me, who has been adjusting the numbers before and after 1998. If he were adjusting Pre-1995 months cooler and after 1995 months warmer, then I would have used that year as the “Cherry Picked” date. Can you see that Hansen is the one who finds cherries delicious? This again brings me back to my previous question which, as of yet, you have avoided answering. Why does Hansen continue to do this if the science is so sound? Scientists who question AGW are ostracised, then the result of the ostracising, less publications and less funding, have been cited to prove that only the less fit scientists doubt AGW. If consensus does not guarantee correctness, the consenters should cite some real evidence that they are correct and stop harassing anybody who would attempt to follow the data wherever it seems to be leading them. The people at Newsweek seem to have thought, at least for a short time, that there was a scientific consensus on global cooling, see http://denisdutton.com/cooling_world.htm. I remember reading that article when I was a teenager and worrying a little about the predicted famine. I would assume that the Greek flat-earth populace and rulers got that idea from the consensus of earlier experts? Are there other things in the list that you consider to have never been a consensus, or that you consider to still be the consensus? #34: the earth … has been flat or slightly cooling for the past 12 years. #59: I am not saying that the earth is not warming. Really? You plugged in some numbers and asserted that one data set diverges from your preferred data set, therefore the data set you disagree with is wrong. Did you also plug into your pocket calculator that each out-dated satellite is calibrated differently? What’s your criteria for believing the satellite data is more accurate that GISS? “the earth … has been flat or slightly cooling for the past 12 years.” Correct. “I am not saying that the earth is not warming.” Correct. I’ll ask the question for the third time. Why does Hansen continue to do this? No, I’m comparing Hansen’s data to Hansen’s data as he adjusts it from month to month. Read #34, #39, #59 more carefully. I’m comparing trends over time, not temperatures. The corrected satellite data is more arbitrary and doesn’t show an agenda driven pattern that Hansen’s GISS does. The UAH corrections for drift, end of life and merging of new satellites etc., have been well documented and match well with the data from the other totally independent satellite method of data collection of RSS. Dougetit: “I’m comparing trends over time…” How far back, 10-15 years? That’s not a trend. First homogeneity adjustment isn’t some newfangled term Hansen came up with, and it’s disingenuous to imply otherwise. It’s used all the time by researchers on raw data and for a variety of reasons. Why condemn just Hansen? Why not condemn the entire field of climate science for engaging in homogeneity adjustments? Sorry, but until then, any further discussion with you would be pointless. So, I got the UAH and GISTEMP data. Just so we’re clear, I’m using “divergence” to mean the difference between the UAH and GISTEMP data for a single period and “divergence trend” to mean the trend in those differences over multiple periods. 1. Over the full period, the divergence trend between UAH and GISTEMP is very slightly positive (0.02degC/dec), but R-squared is only 0.04, so it’s not statistically meaningful. 2. The average UAH-GISTEMP divergence from 1978-1997 is only very slightly less than the average divergence from 1998-2010 (0.24degC/dec vs. 0.26degC/dec). 4. The overall (1978-2010) UAH temp trend is 0.13degC/decade. For GISTEMP it is 0.17degC/decade. Four one-hundredths of a degree per decade is really not much of a difference. In general, I find that the GISTEMP shows slightly higher temps than UAH (no big surprise there)–but it’s pretty consistent. I simply don’t see where the divergence between UAH and GISTEMP is increasing, which, if I understand correctly, is what you’re claiming. Perhaps I misunderstand your point. Great! Now we’re getting somewhere. What source are you using for the UAH Data? No. They got the idea from their gut instinct (“If the earth weren’t flat, people would fall off at the edges”.) It’s the same logic that skeptics use when they think that a snowstorm outside their window disproves global warming. They don’t get those ideas from the experts. Same results, sorry. The GISTEMP data is identical. UAH is very slightly different (e.g., 0.198 instead of 0.200), but not enough to change the result. 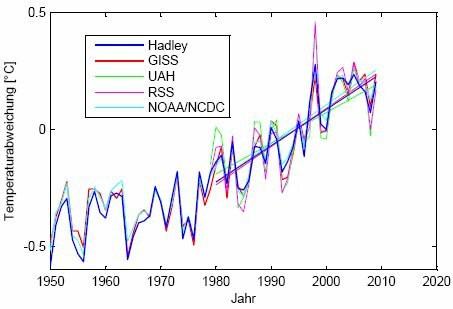 At RealClimate, Hansen has a graph of which I linked to showing the same thing. Hansen has a graph of which I linked to showing the same thing. Yes, I saw that when you posted the link earlier. Thought I’d take a whack at putting some numbers on its face. As usual, there’s no “there” there. So is Dougetit a charlatan or honestly confused over the math? I fear the former, which means he was wasting everyone’s time. What does it take to get published in the field? Is it possible that the reason that 97%-98% agree is that those who don’t agree are much liess likely to get their work published? First, the more serious of the “skeptical” scientists (Lindzen, Christy, Landsea before he changed his mind, etc.) don’t seem to have any trouble getting published. Second, the numbers from the study track quite well with other measures of scientific opinion such as polling. So, really, the results here should be classified as confirmation of previous results, not stunning new results. So is Dougetit a charlatan or honestly confused over the math? Hard to say, since he has yet to return to defend his claim. I fear the former, which means he was wasting everyone’s time. Well, he certainly wasted some of mine. What he claimed to be tracking doesn’t exist, as far as I can tell. Allow myself to Un-Confuse you with some facts and pretty pictures. This is due to the fact that James Hansen at NASA-GISS adjusts anomalies pre-1998 cooler while after 1997 anomalies are adjusted warmer with each monthly release of his data set. These manipulations allow him to make his ever more alarming “warmer than anytime in history” statements. For instance, when comparing data he released just 5 months ago, (Dec 2009), compared to the most recent data, we find that there were 52 anomalies changed before January 1998 to warmer and after January 1998 to cooler. There were 101 anomalies before January 1998 that were changed cooler and after January 1998 to warmer. Nearly twice as many. Who is the charlatan guilt? Hmm? For the fourth time…. Why does Hansen do this? It is only a matter of time before the music stops and Hansen will be caught without a chair. The fact remains that there is very little difference (just 0.03degC/decade) between the UAH and GISS overall trends for 1979-2010. As to the adjustments, you’re simply asserting that the adjustments are “manipulations” to maximize warming. You don’t have any basis or evidence for this assertion. And that’s all it is.